Experienced ZAR collectors - Help, please. What you can also see from the pic is the unfortunate scratch, which could look like the second shaft being scratched off. I dont believe this to be the case. So please share your views with me, hopefully they are the same as mine :grin:. Thank you coinoissuer, I appreciate it a lot. 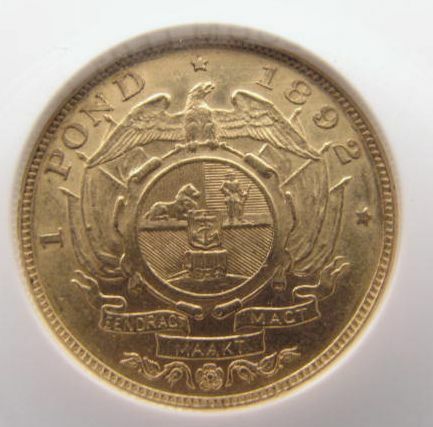 The irony of "os" on the 1892 coin might be lost on some collectors. Fable has it that it nearly cost Paul Kruger the election that year. OS stands for Otto Schultze, the designer of the coin, and also stands for OX in Afrikaans. What made it worse was the ox wagon in the double shafted version was a European gypsy wagon NOT an authentic Voortrekker wagon drawn by sixteen oxen. To me the OS variety reflects a more interesting history although this has nothing to do with the ACTUAL scarcity value. "OS" Kruger coins are, to me, the most interesting and the minting of the single shafted variety was, like the crown, a belated attempt to cover up the "os" variety. And I agree with Anthony - looks authentic to me. I sympathise with your dilemma. Four years ago about, I had an NGC graded XF40 Double shaft Pond that did not have the O.S. on the shoulder but still had two shafts and similar sized wheels. The buyer wanted a refund saying that it was a fake. Reasoning with him I said that for it never to have had an OS, that meant the die used for the obverse was used for the Single Shaft Pond in Pretoria must have taken a trip to Berlin (back in time) to be used together with the die used for the Reverse of the Double shaft pond. Now does that make sense? I think the second shaft in your coin was deliberately scratched off as the remaining shaft is off centre and there seems to be a proximal remnant of the first shaft still present. I enclose what the Reverse of the SS pond does look like. I thank you for this most interesting posting. This coin is confusing me like no other, I guess I'll take it off BoB now and start it @ R1 and tell the buyers to decide. I must admit that I have never been very struck with the size difference in wheels in these single shaft ponden, especially where there is wear as in your coin , I find it hard to be sure that there is this size difference at all. With regards to your first reply you said that the "remaining shaft seems to be off centre." 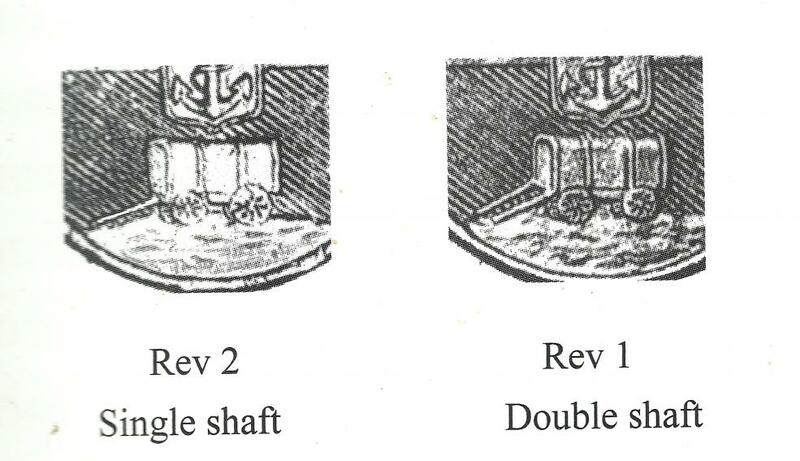 If you look at the image I scanned in from Hern's Handbook you see that for a double shaft pond there is no gap between the shaft and the ground as there is with the single shaft. In my pond there is a clear gap. 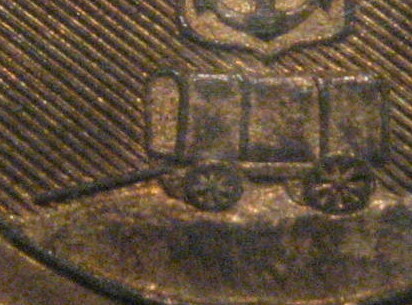 I understand that you thought the shaft is "off centre" because it does look like that, however, if you look closer you will see that it IS in the centre because the nearest end of the wagon is worn. 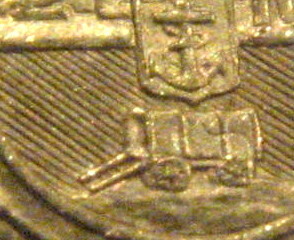 I have taken close ups of Mint State ponden of both SS and DS as well as a Mint State Penny and it seems you are correct. Because there has been tampering around the shaft, it seems as if there is a second remnant of a shaft that was not there in the first place. 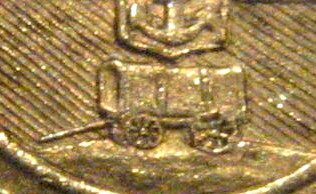 The wheels are also of different size on second look although the front wheel is very worn. I have included a close up of the Shaft of a Penny where the definition is much better than Gold and the wheel difference is very obvious. (I also took advice from my wife who has an artist's eye !!!) Your observation of the shaft of the SS being off the ground is well made. The DS Pond has its closest shaft seemingly on the ground and the furthest one off.The total absence of the O.S. in an otherwise DS Pond can be explained I think in retrospect to deliberate rubbing off and not wear in an XF coin. The O.S. is situated away from the high point of the coin on a sloping shelf where perhaps only part might be lost with wear but not the whole inscription. This is a damaged 1892 SS Pond therefore and the discussion is what makes numismatics come alive, not just hiding away such rarities or what sold for what and who at Heritage. A good topic for a Collectors Society!! Thanks for your persistence - "aanhouer wen"
Lol, Thanks geejay. Off topic now, but is there any news on the collectors society that you were starting? I am collecting names of interested collectors - it is mainly the Spirit of the Society that must develope and be truly representative of all collectors so far . Thank you for the enlarged picture you've sent me. 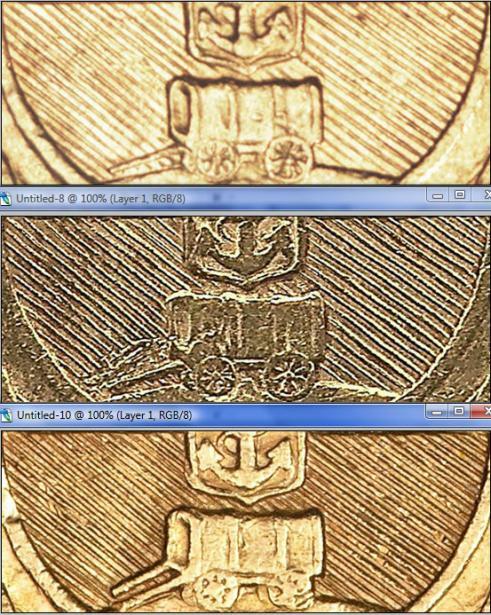 With this new picture, any doubt of tooling or tampering on the coin is wiped out. I can now confirm without doubt that this is a 1892 Single Shaft Pond. It should also be noticed that the ground in front of the wagon is more slanted on the double shaft pond than on the Single shaft. Something my Father showed me many years ago. Great close ups that you have presented. Thank you for your input 4 kids. And I thank everyone for showing interest. If this is what the collectors society is going to be like, I honestly can't wait. Anyways I've put the pond up for auction starting @ R1 if any of you are interested. Good luck and if I haven't wished any of you a blessed new year, I'm doing so now.